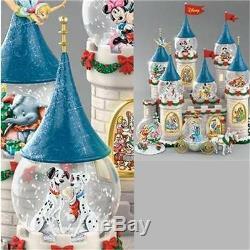 Disney's Christmas At The Castle Snowglobe Collection. 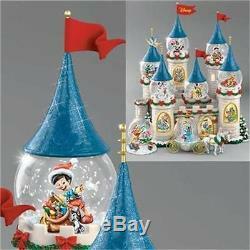 8 Disney Christmas Snowglobes With Lights And Music. 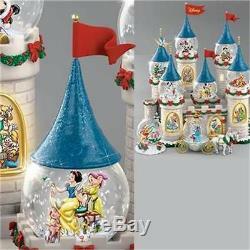 (Complete set of 8 snowglobles + Castle Tower). (Brand New, in original packaging, never opened). Meticulously handcrafted in artist's resin, then hand-painted for attention to the smallest of details, including golden accents for a magical touch. 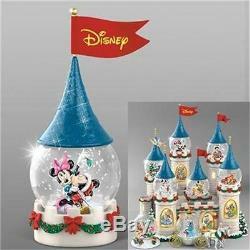 The 8 removable miniature snowglobes in this collection each showcase unique Disney characters in fully sculpted holiday scenes, including Cinderella, Mickey Mouse and Minnie Mouse, Pinocchio, Dumbo, Bambi, Winnie the Pooh and many more. Castle towers illuminate with LED lights to showcase licensed Disney imagery in the windows. 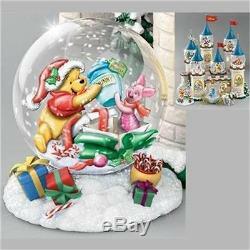 Plays 8 favorite holiday songs, including "Jingle Bells, " and "Deck the Halls". 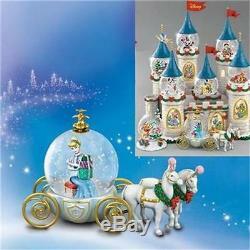 Gently shake the snowglobes to see swirling "snow" and glitter create a magical winter wonderland. 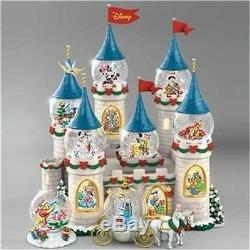 Castle requires 3 "AAA" batteries (not included). Editions are limited to 120 crafting days. Globes measure about 2½"-4" high 6.5-10.2 cm. 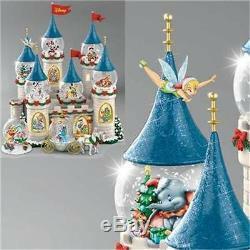 Castle display measures 9" x 9" x 7 (22.9 x 22.9 x 17.8 cm). Full display stands 11½ high (27.9 cm). 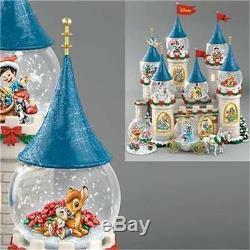 The item "Disney Christmas At The Castle Snowglobe Collection MUSIC & LIGHT NEW" is in sale since Sunday, October 02, 2016.